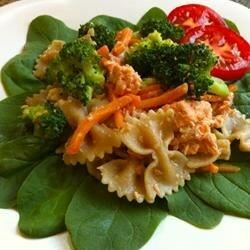 "This yummy salad features salmon, fresh vegetables, and a delicious dressing! I created this recipe myself! This is very easy. Anybody can make it!" Bring a large pot of lightly salted water to a boil. Add pasta and cook until al dente, 8 to 10 minutes; drain. Bring a separate large pot of water to a boil. Add the broccoli and carrots, and cook in the boiling water until tender, 2 to 3 minutes; drain. Combine the olive oil, soy sauce, red wine vinegar, garlic, lemon juice, salt, and pepper in a sealable container; seal. Shake vigorously to make the dressing. Toss together the drained pasta, drained vegetables, salmon, and dressing in a large bowl. Store in refrigerator up to 4 days. Your favorite club sandwich is a salad! Wonderful in the summertime, super easy to make, and also great with rice instead of pasta!